Quite often we hear concerns regarding the safety of soy for women’s health, particularly related to breast cancer. But did you know that eating soyfoods regularly may be protective against breast cancer, especially when begun in childhood or early adolescence? The American Institute for Cancer Research reviewed the latest research for evidence on soy and cancer in 2014, and released a position statement¹ that soyfoods are not only safe but “contain several key nutrients and phytochemicals studied for their cancer prevention properties.” The American Cancer Society confirms this statement and supports soyfood consumption. Women who eat soyfoods regularly are less likely to develop breast cancer compared to those who don’t. Researchers at the University of Southern California found² women averaging one cup of soymilk or about half a cup of tofu daily are 32% less likely to develop breast cancer and have a 29% decreased risk of death, compared with women who ate little or no soyfoods. So what are some ways to increase soy consumption in the diet, particularly those that may appeal to young kids? House Foods offers a wealth of tofu recipes on their web site, HouseFoods.com. 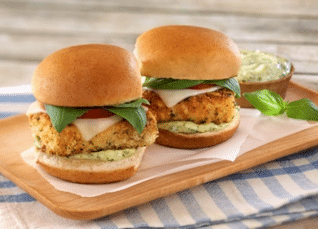 To get you started, here is a simple and tasty recipe for Crispy Parmesan Tofu Sliders. Pesto Mayo: Stir all ingredients for mayo in a small bowl. Refrigerate until ready to use. Quarter block of tofu into 4 equal pieces. Slice each quarter horizontally into 2 thin pieces. In shallow bowl, beat eggs with mustard. In another shallow dish, place bread crumbs and parmesan cheese; mix well. In a third bowl, combine flour and herb seasoning. Heat oil in a large nonstick skillet over medium heat and add tofu to skillet cooking 3 to 4 minutes per side or until golden brown. Top with mozarella slices after turning tofu. Spread sides of buns with pesto mayo and place tofu slices, topping with basil and tomato slices. ² Wu AH, Yu MC, Tseng CC, Pike MC. Epidemiology of soy exposures and breast cancer risk. Br J Cancer 2008;98:9-14.
ᶾ Lee SA, Shu XO, Li H, Yang G, Cai H, Wen W, Ji B-T, Gao J, Gao YT, Zheng W. Adolescent and adult soy food intake and breast cancer risk: results from the Shanghai Women’s Health Study. Am J Clin Nutr. 2009;89:1920–6. ⁴ Gilchrist JM, Moore MB, Andres A, Estro­ JA, Badger TM. Ultrasonographic patterns of reproductive organs in infants fed soy formula: Comparisons to infants fed breast milk and milk formula. J Pediatrics. 2010;156(2):215-220.